You work hard in your business, and you also work hard to market your business online. So, it can be pretty frustrating when, despite your best efforts, it’s your competitor that ranks well locally. It’s your competitor that appears in Google’s coveted three-pack. In fact, that’s why we decided to write this post. A successful local SEO campaign needs a unique blend of on-site strategies with off-site ones. And, because we specialize in doing exactly that (we’ve already won a prestigious national award, the Landy Award for the Best Local SEO Initiative), we’ll share answers to nine different questions to help you get the local online visibility you deserve. Question #1: What is a good litmus test to determine if an SEO agency is good at local SEO? That’s easy. The agency will explain, in detail, what they’ll do for your company. And, they’ll explain everything in a way that makes sense. If an agency talks about a proprietary process (or, maybe even worse, a “secret sauce”), then that’s not the right agency for you. After talking to a good local SEO agency, you’ll finish the conversation with the feeling that you know exactly what they’ll be doing for you and why. Now, here are answers to eight other local search questions we’re often asked. Question #2: What exactly is local SEO and how are its techniques different from organic SEO strategies? When you talk to local SEO companies about their strategies for your company, pay close attention to what they say about getting your company into the three-pack listings. What strategies will they use? Local SEO is a unique mixture of art and science, evolving as Google makes changes to its algorithm. Quality companies evolve right alongside these changes (without algorithm chasing! ), while also proactively learning about likely changes in the algorithm and SERP placements. That way, the agency has a plan in place, if needed, right out of the starting gate, and can react quickly. Quality companies also monitor site metrics to help ensure that their strategies are remaining effective. Question #3: How does Google decide how to rank companies in the local pack? Prominence: this refers to how well-known a business is, with familiar, more established store brands, as just one example, having an edge; a company can gain online prominence by being visible online, though, including through Google reviews and link building campaigns that increase your online authority signals. Question #4: What is Google My Business (GMB) and why would I need this if I have a good website? GMB is a tool provided by Google so companies can manage their business information in Google. The tool itself is free, but it does take time to claim/verify your business listing and to strategically optimize the listing for best SEO impact. According to a 2014 Oxera report prepared for Google, businesses that verify a GMB listing are two times as likely to have consumers consider them to be reputable. From a practical sense, having the right information in GMB means that, when people use Google Maps to find your business, they will have access to the correct information, including your address, your phone number, your hours of operation, your website, and other key pieces of information. Here’s an even shorter answer. Without a GMB profile, you can’t rank in the three-pack. No matter what. It’s vital that the name, address and phone (NAP) information found on your website and in accompanying schema matches that of GMB (more about schema soon). Think of GMB as the Yellow Pages of the digital age and you’ll quickly see why inaccuracies are highly problematic. If there are any discrepancies in your NAP, prioritize this fix because accurate business data is crucial for your site to perform well in Google’s local search algorithm. The maps section of Google, as just one example, relies heavily on accurate data so users can call the right number and get accurate driving directions. And, here’s the bottom line: If your online NAP information is incorrect, Google won’t trust your listing enough to prominently show it in response to searches. If you have a physical location, and a digital marketing consultant tells you that you don’t need an accurate and optimized GMB to succeed online, don’t walk away. Run. If an agency tells you that they manage local SEO campaigns but don’t include GMB in their mix of strategies, run even faster. Question #5: Why are Google reviews so important to local SEO? Simply having more reviews, though, isn’t enough. It’s what is being said in them that really matters. 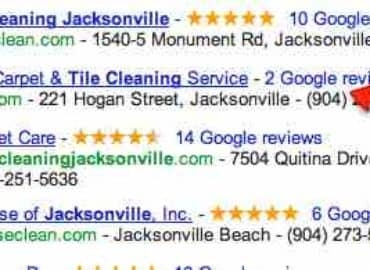 GMB pages that contain reviews that use keywords and/or the city name, for example, rank more highly in the local pack. To get more Google reviews, encourage satisfied clients to write one. To make it easy for them to do so, you can create a unique link that will take these clients to exactly the right location. But, pace yourself and avoid all of these do-nots. Do not create a situation where customers flood Google with reviews. This will look spammy. A measured, natural-appearing pace is best. Do not specifically ask customers to write a positive review; just ask people you expect will provide positive comments to write a review. Do not offer discounts or giveaways in exchange for a review. Do not write a fake review to try to boost your rankings. Do not ask anyone else to write a fake one for you, either..
Do not write anything negative about your competitors in their Google Reviews or encourage anyone else to do so. Here’s another litmus test: A good local SEO company will explain, from the very beginning of your time together, how reviews are important. Plus, they will either work with you to generate more reviews using your existing tools or provide a good list of online tools to help you consistently generate good reviews. And, here’s information about customer engagement marketing and Google Reviews. Question #6: What are citations and what role do they play in local search? If the information found in citations conflict, Google is less likely to trust your website, which means you’re less likely to rank well. Plus, potential customers may go to the wrong address, call the wrong number or go to your business when you’re closed, none of which is good for business. It’s also important to monitor your citations, because they can easily appear without your knowledge through the use of automated aggregation tools. Errors need found and corrected as soon as possible to help prevent any negative ranking impact, as well as loss of foot traffic and any reductions in associated revenue and/or reputation. You can test how your business information appears online by using our free listing scan tool. So, here’s another litmus test: a quality local SEO company will provide citation generation and cleanup services. They will also be able to explain the importance of these services. Question #7: How do we find the best local SEO company for our business? What locations need increased sales the most? What products and/or services need a special boost? The more specific your goals are, the more effectively a qualified local SEO company can devise a strategy and the more precisely results can be measured. Make sure you have enough time to provide your awesome new local SEO company the input they need to do a good job. Remember, any marketing campaign is only as good as the input received. Be patient, too. SEO in general takes months to move the needle and local SEO is no different. That said, here are specific ways to find the best local SEO company for your business. You first want to create a list of companies to contact. And, using Google to make your list is a practical early step. Ironically, though, choosing a company that ranks highly in your area for local SEO services isn’t necessarily the best strategy. That’s because agencies that are busy with client work prioritize their own sites last. You shouldn’t necessarily discount top-ranking local SEO firms, but don’t immediately assume they’re the best, either. Plus, like with any service, you can get recommendations by asking other successful local businesses what digital marketing firm they use, checking to see who has won relevant awards and so forth. You can also check online reviews, although this should not be your stand-alone strategy, either, because it’s fairly easy for competitors to pay for reviews. Places to check are Google Reviews, Facebook and the like. If an agency has a long list of negative reviews, this could very well be a warning flag. If there are some negative ones interspersed with mostly positive ones, then the real question to jot down to ask is how the agency handles negative reviews because you’ll want to make sure they have a solid plan in place if/when you get one. Once you have a list of local SEO agencies that interest you, check the websites of those companies to see what local SEO case studies and/or testimonials they include on their website. Most SEO agencies will have multiple case studies but how many are for local SEO? If they don’t list any, consider this a red flag. You can find our case studies here. Set up conference calls with potential SEO agencies that make your short list and, when you talk to each company, ask if local search is one of their specialties. Also ask them about their overall philosophy of local SEO. Some companies may claim to “do local SEO” because they create and optimize location pages on client websites. While that is a component of local SEO, it is just one step in a multi-pronged campaign. The reality is that a digital marketing company can be quite proficient in organic SEO but not really know much about local SEO at all. And, although some ranking factors are the same between organic SEO and local SEO, there are numerous factors that are unique to local search, and you need and deserve a company that specializes in local. When on a call with an agency, talk to them about your specific needs and pay attention to whether they clearly answer your questions or try to avoid answering. If they say they’ll get back to you with information, do they? When they said they would? And, here’s the real bottom line: Does what they say make sense? After one round of calls, it will probably be pretty clear who the finalists are. After your initial calls with potential local SEO companies, ask yourself, “What did I learn?”. A good agency will review your SEO and local SEO signals before you do business with them. If, though, the call was more salesy in nature, one where you learned more about the agency than about your own needs, then this is probably a bad sign. When you find an SEO company that you like and trust, ask them for client references and then contact the references provided. If that process goes well, then it’s time to do a final clarification of what the agency will provide for you and at what cost (more about pricing soon) on what timeline. It isn’t reasonable to pin your local SEO agency down to the precise actions they will take, but it is reasonable to ask to understand the processes being undertaken. Ask the agency how often they will hold conference calls with your company to discuss progress and answer questions. Ask who, specifically, you will have access to. Some companies bring out the big guns during sales calls and then assign your account to an inexperienced junior consultant. Also ask how often you will receive progress reports and what will be included in them: Rankings? Traffic? Broken down by location? What else? When you have a question in between meetings, how should that be handled? By email? What can you expect as a typical response time? Question #8: How much should my company pay for local SEO? Getting your business listed in the top 50 online directories is a core strategy for local SEO. For some industries, you may need up to 100 citations. The cost of managing citations ranges from $50-$150 a month. Another fundamental component of local SEO is quality link building, and this can cost $500-$1,500 monthly. If you have one website listing multiple business locations, there are efficiencies involved in the work being done and the associated pricing, but you should still budget $750-$1,500 per month per new location. Simply finding out what local SEO costs is really only step one of the equation, though. What really matters is the amount of value delivered and your return on investment. Question #9 Why should we choose DAGMAR Marketing for local SEO? Local SEO is one of our core services, and we are known for consistently getting impressive results for our clients. In fact, we won a highly prestigious national award for local SEO. SEO tactics come and go, and are continually evolving. So, instead of spending your budget chasing Google’s latest algorithm, we build your local SEO campaign on solid, time-tested marketing strategies. Our focus on the factors that truly matter helps to create local visibility that endures and positions you for natural rankings growth over time. As proof, we invite you to look at what we did for Turner Pest Control. In one of the most competitive industries in Florida, the DAGMAR Marketing team helped Turner with significant business growth in multiple cities. In their case, we discovered that previous SEO tactics had caused them to incur a Penguin penalty from Google, one that negatively impacted their rankings. We designed a penalty recovery program along with a customized SEO program. Within three months, they witnessed significant traffic gains. Whether you’re new to local SEO, have spent too much already without results, or just want to work with people you can trust to have your best business interests at the heart in all they do for you, we’d love to talk with you. And, whether or not you choose DAGMAR Marketing as your next local SEOagency, we hope this article can arm you with enough information so that you can make a sound choice.